One of our main tasks as human beings is to seek and to discover what is real and true. We must use intelligence as our main tool and sound reason as the verifier. That is all we have at this point. However, as we go about deepening our understanding, we still carry one problem with us: this mind that reasons so intelligently is still basically confused. Therefore, every “insight” is saturated by confusion. I am sorry to say it so bluntly, but human understanding is confused. It is not unmistaken wisdom, and it is not authentic until complete enlightenment. Can we admit that we are not yet enlightened? The awakened state of a Buddha is one of perceiving clearly, distinctly and completely the nature of things and all that exists. It is a wisdom that knows things as they are without confusion, without distortion. This is why we ordinary human beings cannot avoid seeking support in the words and teachings of a Buddha. I cannot, at present, say whether this is good or evil; it is merely an observation. Just the same, if we are concerned with a Buddhism of authentic value, I would suggest that we give center stage to the Buddha surrounded by the great masters of the lineage. Actually, I consider this of vital importance for the future of the dharma. My main point is that the original words of the Buddha are very important. 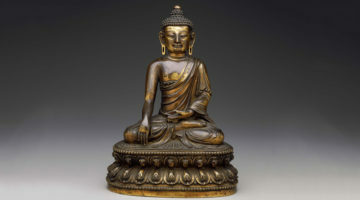 Even during Nagarjuna’s time, a climate of debate and counter-arguments prevailed in India, and some Buddhists accused him of distorting the Buddha’s words. The same thing happened to Padmasambhava. That is why we should give the original words of the Buddha special emphasis. In the framework for Buddhist studies found in Dzogchen, the first main point concerns that of our basic material, our basic ground—our buddhanature. I feel it is important that we gain some comprehension of this point. Next is the path stage, our present situation that proceeds from the occurrence of confusion. What does this confusion consist of? How is it perpetuated? What is being confused and how? How sound is the tendency to maintain a duality of perceiver and perceived? How do we fool ourselves into believing in a self? How does this confusion trigger karmic actions, emotions and further tendencies? These are important topics, and we must admit that we are confused. We are in the middle of a chain reaction that has already begun. We cannot cleverly step around it and feign purity and enlightenment. We are already confused; that is our present situation. The next step is to understand that our situation is not irreparable. The tendency toward confusion does not have to be repeated forever. One of the essential points in Buddhism is that confusion is only a temporary event and not our basic nature. Therefore, confusion can dissolve, be cleared up, and cease. This is where Buddhist practice comes in because the general methods and the extraordinary Vajrayana instructions are the practical tools for dissolving the tendencies of confusion. At this point, the question often comes up whether a beginner can find his or her own way by reading a few books and doing a little sitting practice. I am sorry to say that the confused mind is not its own solution. Some support is necessary. We usually refer to this support as refuge: the triple gem, the three precious ones—the Buddha, dharma and sangha. In our immediate experience the most effective support is the dharma, because when we hear a truly valid statement and method, think it over until it is clear, and then put it to use, its validity is proven by its clearing up our otherwise mistaken and bewildered state. Without our doing this, the confusion would have continued its own habit. Because the teachings and their authentic value are a reality in their minds, we receive the dharma from the present holders of the living lineage. Someone who has realized the end of confusion can genuinely represent the Buddha’s lineage, and such an ambassador is called sangha. The advice that he or she imparts is the dharma, and the source of such valuable instruction is the Buddha. This is why the three jewels are called precious. The reason for this is experiential and not merely a belief. While belief is tenuous and often blind, faith, interestingly enough, is regarded as vital in the practice tradition of Buddhism. But the defining quality of Buddhist faith is radically different from faith in other religions. It is referred to as “trust through knowing the reason.” How does one know the reason? We know it by applying the pith instructions. When we do so, the actual experience of nonduality gives rise to trust in the teaching that provides for this experience. In this way, we can be free from even the slightest doubt. Such trust is due to knowing the reason, namely that applying the dharma liberates confusion. The sangha introduces us to this fact, and the Buddha is the source. Hence, the three jewels are interconnected with our own practice. We can have true trust. 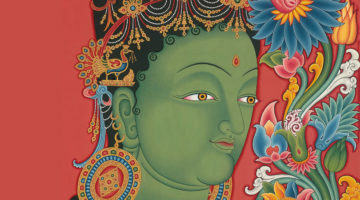 Trust and pure perception are two essentials in Vajrayana practice, and when brought vividly alive in our personal experience, they open a door to direct recognition of the original wakefulness that is the nature of emptiness. In the general teachings of the Buddha, devotion can often be understood as admiration and a fondness for understanding. The more sincerely interested a practitioner is in realizing the empty nature of personal identity and of the identity of things, the closer he or she comes to realizing it. While in Vajrayana devotion is regarded as one thought among all other thoughts, it is the most potent, the most effective. In this sense it is equal to another type of thought state, that of compassion. These two are considered the most noble and most powerful. It is their immense power and goodness that succeeds in interrupting all other kinds of thoughts, especially the unwholesome types. The pith instructions and spiritual songs (Tib. : dohas) always emphasize an intensity of devotion and sincerity, which is not often found in the philosophical textbooks. An overwhelming and almost unbearably pure state of compassion or devotional yearning strips the mind bare of conceptual veils so that awareness is revealed in its most naked state. Please understand the vital importance of devotion and compassion—and in Vajrayana, especially that of devotion. If you have already found and accepted a Vajrayana master, then this of course implies that you try to regard whatever he or she says or does as pure. Not only the master but also your fellow practitioners—whatever they do or say, you must try to appreciate with a certain purity. The general teachings of Buddhism do not speak much about pure perception, and I understand that it could be a problematic issue. However, the training in pure perception is, in itself, extremely effective for fast progress. It is a swift path. Let me summarize the essential points of the sacred dharma. Weariness and renunciation are essentials, as are loving-kindness and compassion, as well as trust and devotion. When these three aspects conjoin in a practitioner, he or she can readily recognize and realize the view of emptiness. If something is amiss with these three, it is difficult to realize the view. Without weariness one doesn’t feel the need to practice; lacking love and compassion is like trying to fly without wings or walk without legs. Without trust and devotion—I’m sorry to say this so bluntly—one cannot comprehend the profound teachings of Vajrayana at all. Renunciation here should be the renunciation of ego-clinging, not just of some filthy place. Love and compassion should be not just for friends and family but for everyone, without bounds. To have these, we need to train ourselves. A synonym for Vajrayana is Secret Mantra. “Secret” here refers to the fact that its own nature is a secret to the confused mind. The fact that accomplishment can be reached within a couple of years or within this very lifetime is entirely connected to realizing this nature of mind, and this requires trust and devotion. The importance of trust and devotion is not so clearly stated in the Buddha’s general teachings for good reason: it is hard to accept. Dear reader, isn’t it true that most people would not accept this? Isn’t it true that if beginners were told, “Obey every word this Buddhist master tells you and see everything he does as perfect,” then their immediate reaction would be to say, “It’s a cult!” And yes, it definitely looks like it, at first glance anyway. This is certainly a difficult issue. Let us not limit pure perception to the master, however. A Vajrayana practitioner should regard his or her vajra siblings with the same respect and purity. This principle does not apply only to our vajra siblings; we should regard every sentient being that way and all phenomena as well. A Vajrayana practitioner should repeatedly train in seeing everything that could possibly appear and exist as having the nature of the three kayas (Skt. three bodies of the Buddha: dharmakaya, sambhogakaya, nirmanakaya). The great mandala of appearance and existence as the manifest ground—that is the pivotal point of inner Vajrayana, no matter from which angle you approach it. These three principles—weariness and renunciation, loving-kindness and compassion, and trust and devotion—allow you to quickly experience the highest, noblest view. This is my earnest conviction. 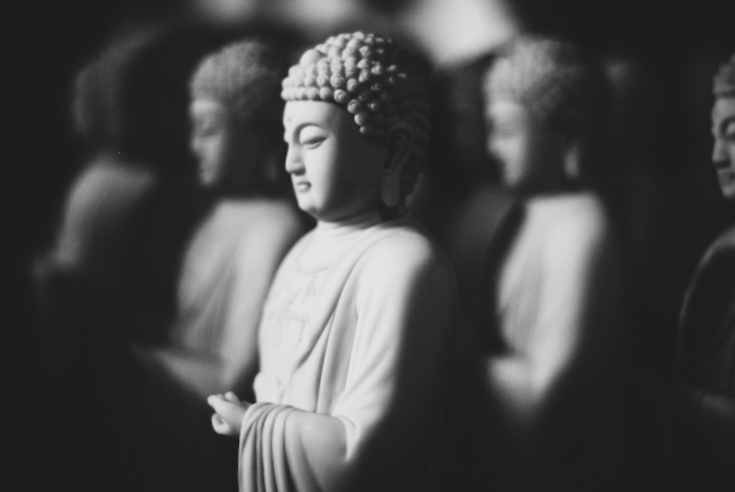 Dharma studies separated from these three may enable you to speak eloquently on the Buddhist view, but, honestly, when has mere talk ever been able to transform the mind? Talk is cheap. You can teach a parrot to say tongnyi (emptiness), kadag (primordial purity), or lhündrub (spontaneous presence). I would like to add that progress on the Buddhist path does not require far-reaching study and reflection. Rather than gather information, it is much more important to take the topics personally as one goes along and apply them to oneself. It does not necessarily follow that extensive studying leads to renunciation of ego-clinging. There is no guarantee that being learned also means being compassionate, nor does it necessarily follow that one has deep trust and compassion. Sometimes it does happen that vast learning hinders progress, so I would like to emphasize that we pay special attention to the proper method of studying the dharma. Removes your triple faults and makes you gentle and peaceful. By reflecting, you feel sure of liberation from the depths of your heart. By meditating, you experience self-existing wakefulness from within. Therefore, persevere in learning, reflection, and meditation. The real benefit of studying the Buddha’s teachings and the statements of enlightened masters is to be inspired to change the way we think, speak and behave, which will make us more civil, gentle and peaceful. When we thoroughly investigate the value of the meaning presented, it becomes obvious that we can become free—each and every one of us. This confidence is achieved through understanding, and understanding is a result of thinking the teachings over. We do not need to let the teachings remain as mere words or ideas; we can put them to use in our own experience. This is how the buddhanature can be revealed, since it is already present in every one of us. That is why I encourage you to study, reflect on, and personally apply the teachings. Let me phrase this differently. If you want to have the certainty that dharma practice will liberate you and others, it is necessary both to study and to reflect: What is it that obscures our basic nature? Why do we lose track of it and get bewildered? Well, yes! It is due to this habitual clinging to duality. If this is so, how do we dissolve dualistic clinging? Well, yes! We need to train in being free of clinging to duality. When this attitude, which maintains duality, is allowed to not be formed, to disappear, to dissolve, to vanish—what is left? What remains is given the name “nondual wakefulness.” Well, yes! This is the freedom from duality; this is how to be free. Now it is clear! Liberation is to be free from clinging to an ego. Liberation is to be free from fixating on solid reality! This is how we can gain some genuine certainty, even without having to go through detailed studies. For many people, liberation from samsara is imagined to be a place far away; this is true for many religions. “When I get to paradise, the buddhafields, then I will be free! I will pray to God or the Buddha, purify myself, create merit, and please the gods, and they will take care of me. They will magically transport me to that pure land.” This may well be a popular belief, but the true Buddhist liberation is to be free of the two obscurations. For that, wouldn’t it be better to understand what the two obscurations are? They are the emotional and cognitive obscurations. As Nagarjuna taught, stinginess and the like are the emotional obscuration, and thoughts that conceptualize the three notions—subject, object and action—are the cognitive obscuration. All you need is a good explanation to understand and identify them in yourself. Of the two, unless and until you manage to dissolve the tendency to conceptualize the three notions, there is no true freedom from deluded experience. When someone has recognized and is able to sustain the true Dzogchen view of primordial purity, then all aspects of practice are automatically included within it. The realization of the view is the ultimate refuge; it is also the ultimate bodhichitta, as well as the true dedication and perfect aspiration. In other words, everything is included within that one state. If it is authentic, such a person can just sit without doing any conventional practice whatsoever. Other people may think, “He’s not doing his chants, refuge and bodhichitta.” But the fact is that such a master is actually practicing the perfect refuge and bodhichitta in completeness. This is an extraordinary and incredibly special quality, and, of course, its actuality is hard to grasp. 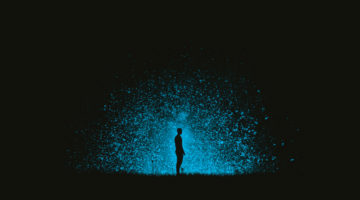 Let me make one thing clear: unless and until you recognize and become able to sustain the continuity of original wakefulness that does not conceptualize the three notions, deluded experience will not end, nor will it vanish. Whether this is said bluntly or sweetly, whether or not you do a lot of purifying of bad karma and gathering of merit, you always have to return to this central point. Any practice that lacks this vital point will, of course, reduce the intensity of confusion. Every noble intention, every altruistic frame of mind, will undeniably loosen up the rigidity of confusion and weaken the clinging to things as being real and permanent—but not permanently and not completely. The only sure way is to train in thought-free wakefulness. Isn’t this obvious? This is what we need. It is the most important point of all. This selection is from The Dzogchen Primer: An Anthology of Writings by Masters of the Great Perfection, compiled and edited by Marcia Binder Schmidt, published by Shambhala. Chökyi Nyima Rinpoche is the abbot of Ka-Nying Shedrub Ling monastery in Kathmandu. Eldest son of the late Dzogchen master Tulku Urgyen Rinpoche, he also teaches annually at Rangjung Yeshe Gomde, his retreat center in northern California.